Pedals, Pipes and Pizza Was a Success! On a cold Saturday in early February, 17 students from the ages of 11-16, enjoyed the warm hospitality of Zumbro Lutheran Church in Rochester, MN for a day of Pedals, Pipes, and Pizza. Thanks to the coordination and hospitality of Kristy Giere, Organist at Zumbro Lutheran the young students were fascinated by the beautiful 52 rank Aeolian-Skinner organ. Their eyes opened in wonder at the first notes of Bach’s Toccata and Fugue in D minor. That piece was used as a teaching tool throughout the morning. They learned about why and how to use different manuals, what different manuals accomplish, what a stop is, how pedals work, what the combination action is and how, by pressing just one key you can get a full spectrum of sounds. Each student took advantage of the opportunity to play their piano score and experiment with different sound settings. An instructional video provided by the AGO, Pulling Out All The Stops was shown to an attentive audience. 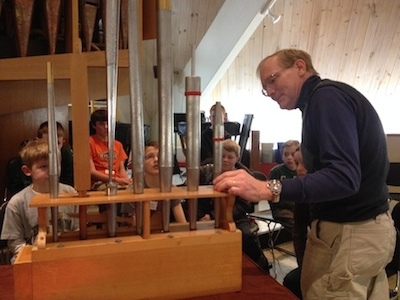 Then organ technician Jeff Daehn showed the enthusiastic students a row of pipes and a good look inside the organ. All this excitement ended with pizza, ice cream, and lovely fellowship. This is an event that the chapter will certainly repeat in the near future! Our chapter celebrated World Organ Day on Sunday, May 5, 2013, with concerts in three locations, covering different parts of the extensive territory of our chapter: Central Lutheran in Winona, Our Savior’s Lutheran in Austin, and St. John Lutheran Church in Owatonna. We thank Brian Williams, James Hammann, Matthew Lehman, Ryan Hulshizer, Neal Erickson, Erik Floan, Nancy Edstrom-Bacheler, Ian Shultz, Aleah Harvey and students from St Mary’s University in Winona . 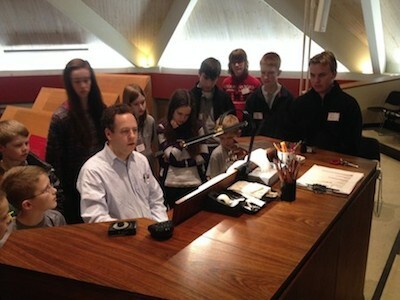 We also thank Charles Whitcomb for hosting an Organ Crawl in the churches of Chatfield, MN. Following the concerts and crawl, we gathered for dinner in Mantorville at the historic Hubbell House. Chapter members will be boarding the Pelican Breeze on June 23, 2013, at 4:30 PM for a pleasant cruise on Albert Lea Lake. We will be joined by naturalist Al Batt for this boat ride. Dinner will follow at Crescendo Fine Dining in downtown Albert Lea. This whole evening will be lots of fun! Register with Brian Poch (brianpoch@charter.net) by June 13. Our chapter will be celebrating World Organ Day on Sunday. May 5, 2013, with concerts in three locations: Central Lutheran in Winona, Our Savior's Lutheran in Austin, and St. John Lutheran Church in Owatonna, MN. The three concerts will be presented at 3:00 PM staffed by members and friends of the SEMN chapter. Among those scheduled to play are Erik Floan, Ryan Hulshizer, Brian Williams, Matt Lehmann, and friend of the chapter, Dr. James Hammann. Following the concerts, there will be an in-gathering of the chapter for dinner in Mantorville. All chapter members are encouraged to attend one of the concerts and then to join us for dinner! Reservations for the dinner will be needed; watch for an email! In addition to the concerts, there will be a town organ crawl in Chatfield to celebrate the day. The crawl will start at St. Paul's Lutheran Church at 3:30 PM. She was the 'little black sheep' daughter, the late last of four children of a very musical family (her father Albert was an organist, composer, and amateur organ builder; her eldest brother Jehan an exceptional composer, who was killed early in WW2 at the age of 29; her second brother, Olivier, a musicologist; her sister Odile, also musical, also died young in a tragic skiing accident). Marie-Claire, encouraged by Jehan, showed remarkable talent, and went on to become the first French woman to record the complete works of Bach (several times), and enjoyed an international reputation for her numerous recordings and concert tours. The list of her students is a 'whose-who' of the present-day organ world. Her health had been deteriorating in recent months. She will be sorely missed. The successful Lenten event on Sunday, February 24, 2013 at St. John the Evangelist is available on YouTube. Chapter members and hundreds of visitors enjoyed the beauty of three magnificent churches and the sound of three impressive instruments! We thank First Congregational Church, St. Martin's Evangelical Lutheran Church and the Basilica of St. Stanislaus Kostka for their wonderful hospitality, and AGO Board member Jon Nienow for his hard work! Visit the Winona Daily News for an article and a photo gallery. Chapter members are encouraged to join in for our Winona Organ Crawl on February 3. This event will begin at 9:30 AM at the First Congregational Church in Winona. Additional sites to be visited are St. Marin's Lutheran Church and the Basilica of St. Stanislaus Kotska. Members are encouraged to bring along some music for trying each of these organs. Lunch arrangements have been made at Signatures in Winona. An afternoon option, following lunch, will be a visit to Winona's famous Maritime Museum. Dr. Mark Rich of our chapter will present a Reformation Organ Recital on Sunday, Oct. 28, 7:30 PM at Bethel Lutheran Church, Rochester. Mark has prepared music by Bruhns, Buxtehude, Pachelbel, Bach, Walther, and Zachow. The program will be performed on the 3 manual Wicks organ at Bethel. Hope to see many of you there! Mayowood House Tours will take place, and we will once again be signing up to provide seasonal music for these tours. These tours happen on Tuesdays, Wednesdays, Fridays, Saturdays, and Sundays throughout November. This is a great opportunity for our chapter to be in contact with many people from many walks, both near and far. A signup will be coming through email and at the next workshop (Oct. 13). There was some question about whether these would happen or not, both due to rehabilitation on the house and the condition of the organ air plant. But all is a go, so we hope to fill many of the slots. Please be alert to chances to sign up for this.